Renowned poet Robert Creeley (1926-2005) was a master bookshelf builder, driven by a need to keep his beloved books “safe, sorted and out of harm’s way,” says his widow, Penelope Creeley. Thanks to a Library Acquisition Grant from the University of Notre Dame’s Office of the Provost, some 200 volumes of the late poet’s works are now safely tucked away in the special collections section of Notre Dame’s Hesburgh Library, with hundreds more to follow. After co-editing “Form, Power, and Person in Robert Creeley’s Life and Work,” Stephen Fredman, professor of English, was awarded $125,000 to support the purchase of Creeley’s library, total cost of which tops $600,000. 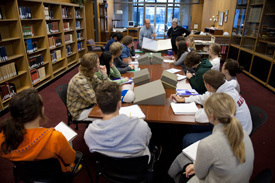 In addition to aiding scholars, the collection is of benefit to students because they have the opportunity to compare their reading experiences in the classroom with actual visits to look at the original books from which their readings are taken, and experience first-hand how the accumulated artifacts of Creeley’s life have become part of cultural history. Many of the acquired volumes and special editions, not widely available to the public, are filled with letters, tickets, articles and reviews, placed there by the poet. This deeply personal look into Creeley’s private life through his books will be further enhanced with the acquisition of an additional 11 museum-quality artist books that are a collaboration of Creeley and other artists. 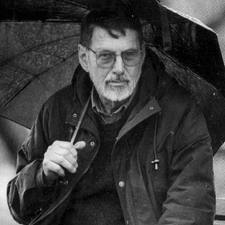 Further study of the collection, according to Fredman, will change perceptions of Creeley, as a hermetic poet, writing in Dickinsonian isolation, to that of a writer actively participating in circles of writers, artists, publishers, editors and musicians – working in the center of these groups. Originally published by Susan Guibert at newsinfo.nd.edu on December 19, 2011.